Original cabinet photograph. About 4 1/4 x 6 3/8" mount. From an album of cabinet cards from the 1880s, all unidentified, most from Adrian, Michigan. 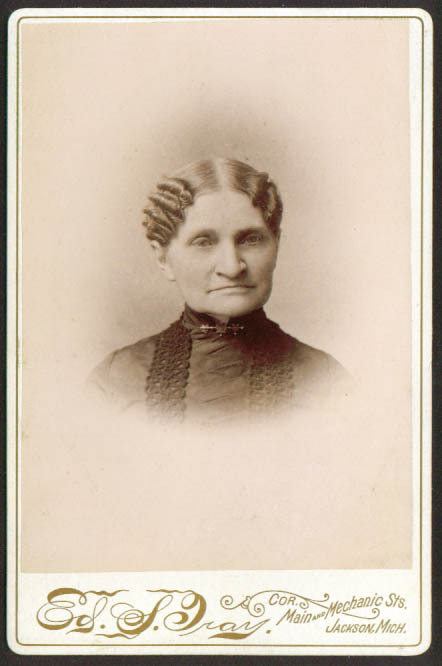 Album also contained a mourning card for a Frances A Bowerman, died at 45 years & 3 days on May 31, 1889. This person may be related to or have the last name Bowerman. We do not know if this is Frances or not. That's all we can conclude from the facts as we have them. Inforrmation stated as we know it. Size stated is approximate. Scans large to show condition and detail. Unseen defects, if present, are described if not visible in scan. VG or better condition.